If you have ever wondered why your plant isn’t blooming, the photoperiod of the plant might explain it. 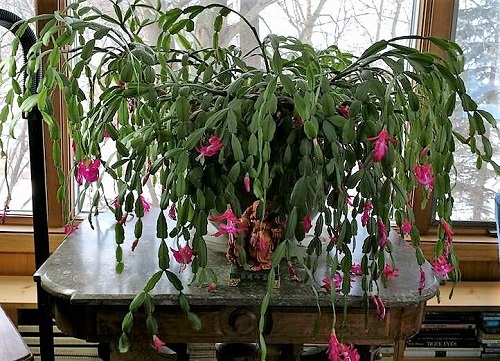 Certain plants such as Christmas Cactus and Poinsettia, as well as garden plants such as Chrysanthemum, bloom in response to specific periods of light and darkness. Most plants that we grow are day neutral. They flower based on their development progression and sometimes encouraged by or in response to high or low temperatures. Contrary to logic, it is not the length of daylight that determines when certain plants produce flowers, but rather the length of darkness! Our so called short day plants, such as Christmas Cactus, Poinsettia, Violets and Chrysanthemums form their flower buds when they experience long periods of darkness, at least 12 hours daily. These short day flowers are spring or fall blooming plants. Interestingly, cool season lettuce and spinach are long day plants. The long days of summer cause them to “bolt”. Many of us have blamed the flowering on the heat but it is specifically caused by short nights and day length. But the long day plants we are most familiar with include rudbeckia coneflower, aster and hibiscus. Most of what we grow of course is day neutral, with blooming dependent on the development of the plant. Short day plants we simply view as spring or fall blooming. The photoperiodism of crops because much more important to farmers and growers who must pay attention not just to temperature zone suitability but also they night length. Consider the differences in night length for example in Alaska versus a tropical zone! Again, we think of crop suitability in terms of temperatures, but of course day length plays a big role. Good to know!